Finance Minister Pranab Mukherjee presented a borrow-and-spend Budget on Monday with a deficit that may be an all-time high, reflecting short-term pessimism about economic prospects. The finance minister reckons on only marginal improvement from last year's GDP growth rate of 6.7 per cent, chiefly because he sees no upturn in international demand. Mukherjee has, therefore, focussed his Budget on boosting domestic demand as a growth driver. This was Mukherjee's fourth Budget (the earlier three were in 1982-84), and he knows that he is testing the limits. He admitted candidly in an interview that this borrow-and-spend strategy was a response to exceptional circumstances and could not hold for the medium-term, let alone for the long-term. You say there will be disinvestment, but the Budget document has only accounted for only Rs 1,100 crore (Rs 11 billion) from this. How much disinvestment will there be in the next two or three years? I have not spelt it out, I have just given the broad parameters and the philosophy of disinvestment. I will retain my 51 per cent minimum, but will disinvest in public-sector enterprises that are making good profits, have professional management and are improving their managerial efficiency. 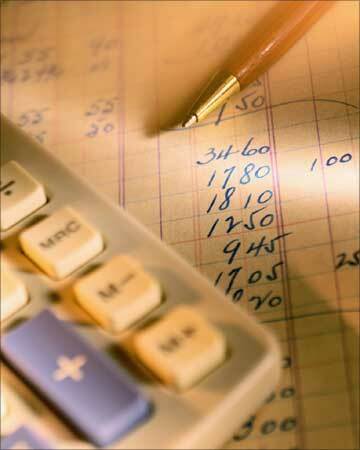 But I would like to do it at the appropriate time, when I can get the best prices for these companies. 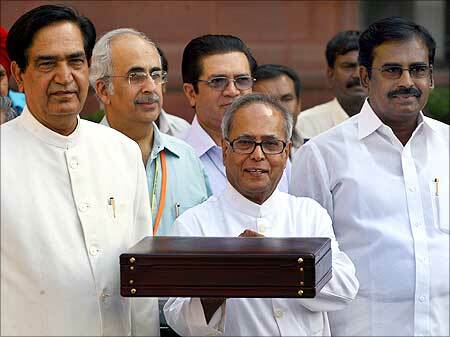 Image: Finance minister Pranab Mukherjee smiles as he leaves his office to present the Budget. You mentioned the stock market and the right price. You would have seen the stock market reaction to your Budget. How do you assess it? My assessment is that perhaps the markets expected too much. They have not taken into account the fact that the external environment is not friendly. For instance, exports cannot grow in India if you consider that USA accounts for 16 to 18 per cent of our total exports and Japan and the European Union 36 to 37 per cent. Unless these economies improve, our exports, whatever palliative we may give them, cannot expect to grow at the same level as they have in the last five years, so that trade is now contributing 38 to 39 per cent of GDP. 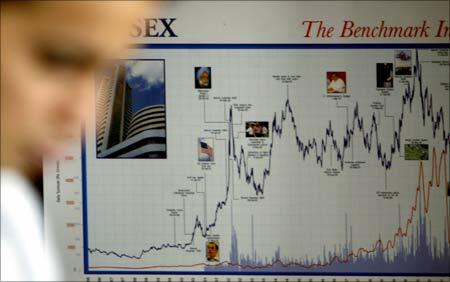 Image: A stock market chart at a brokerage in Mumbai. Therefore, the alternative for any finance minister would be to focus on domestic demand-driven growth, which I have done. This is not populist; I really want to inject these resources into the rural economy, into agriculture, to irrigation and rural infrastructure, so that there is money in the hands of the people and they can spend and generate demand in certain industrial sectors, which you'll have. Keep in mind that between February and July 6 2009 I have added Rs 61,000 crore (Rs 610 billion) for additional developmental assistance -- Rs 21,000 crore (Rs 210 billion) in the hand of the states and Rs 40,000 crore (Rs 400 billion) for central projects. 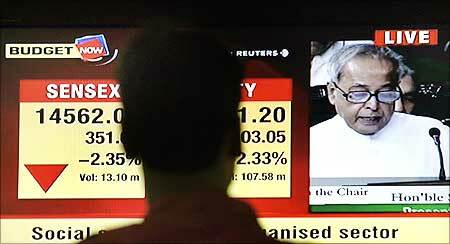 Image: A stockbroker watches a news channel showing Pranab Mukherjee presenting the Budget. How would you react to the criticism that the deficit is too high and the level of government borrowing's going to raise interest rates and crowd out the private sector? I am meeting Reserve Bank, Sebi and other expert groups to see how my borrowing doesn't elbow out the private sector. You have abolished the fringe benefit tax, but the same benefit, so to speak, you're taxing in other ways, so in a sense you've brought back the same taxation through the back door. Is that a correct assessment? No, it is not correct. FBT in its present form has gone. Image: The fringe benefit tax was abolished in this year's Budget. You don't lose any revenue from abolishing it? That's why I'm saying, the direct taxes, even including stepping up the MAT, is revenue-neutral. It is not substantial. I am waiting for the revenue code to come, to have an informed, structured debate, I will put it on the web, along with a paper, I will invite inputs from stakeholders, and after taking that into account I will introduce legislation. The Finance Commission task force has done some numbers on the actual level of tax that should come out for revenue neutrality under the GST, and from what their work suggests, the absolute level of tax will come down when GST is introduced, so there will be a huge tax benefit to all tax payers as a result of GST. But there will be greater compliance. There will be two tax rates of course, central and state, but the fact of the matter is these have been established though there was no economic coordination, but the fact of the matter is when the tax rates were reduced, greater compliance made it up much more. 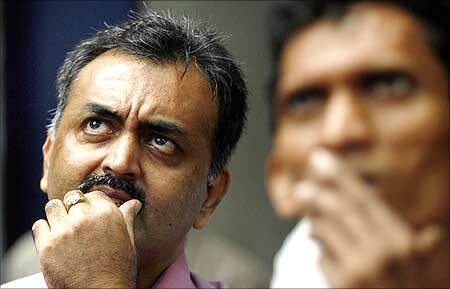 Image: People watch a telecast of Pranab Mukherjee presenting the Budget. The 2009 February Budget postulated a total Central government borrowing programme of Rs 100,000 crore (Rs 1,000 billion) in market borrowing. In your Budget you have projected a total borrowing of Rs 400,000 crore (Rs 4,000 billion). Do you think this is sustainable, and when can you bring it down and how? It is not sustainable even for medium term, not to speak of the long term. But I'm hoping that with the money that we have injected in the system can be utilised. That is the expectation on the basis of which the whole structure has been built up. Regarding the sustainability, these are not the two comparable situations, because what happened in September you could not have visualised in February. . . 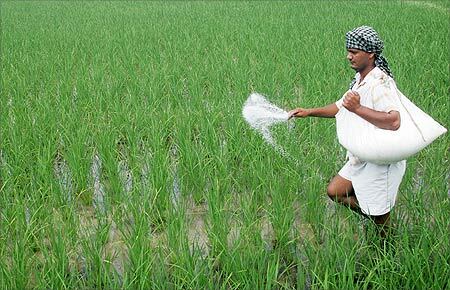 Image: A farmer spreads fertilisers on his rice plants in Patra village in Punjab. Do you think you can bring down the borrowing level to what it was within two or three years? I have given certain figures for 2009-10 and 2010-11 and I will try to stick to those figures. Of course it will have to be constantly reviewed keeping that in mind, so naturally the borrowing level, to that extent, will come down. We cannot maintain this level, I have admitted, but it can be maintained at the short-term level. If I can have in the context of the inclusive growth philosophy and the structure which we have built up laying emphasis on the rural and urban infrastructure, I've stepped up the investment almost double, from 62,000 crore (Rs 620 billion) to 1,24,000 crore (Rs 1,240 billion) and, therefore, apart from the certain other the 100,000 crore (Rs 1,000 billion) which will be coming from the IFCL, they will be able to refinance to the extent of 50 per cent. Housing will be one of the important sectors which will benefit. So, with this, I hope that we'll be able to come back to the old high-growth trajectory, and which in my mind will bring rest of the things to follow one by one. 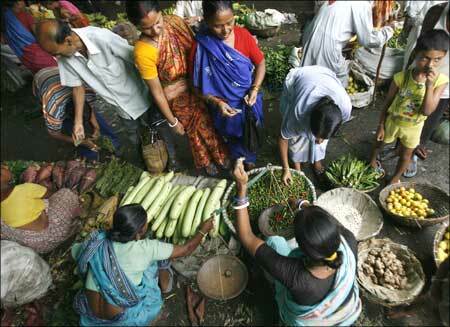 Image: People buy vegetable at a village market.